The Bank and Monument Tube station complex is located in the heart of the City of London financial district and is the fourth busiest interchange station on the Underground network with 96,000 customers during the morning rush hours, which is set to increase. 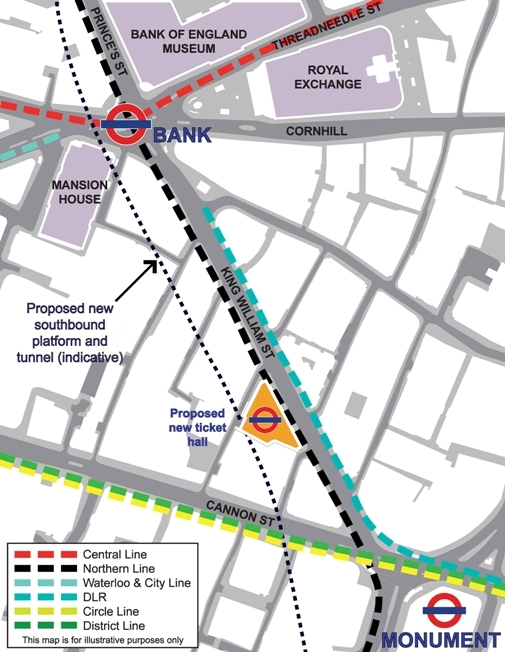 Bank is a key interchange served by six lines (Northern, Central, Waterloo & City, and at the Monument end of the same station complex, the District & Circle), as well as the Docklands Light Railway (DLR), for which Bank is the main central London terminus. The upgrade project will, by 2021, deliver increased capacity at Bank station and a step-free route between the Northern line platforms, DLR and street levels. Following the advertisement in the Official Journal of the European Union (OJEU) in November 2011, LU has completed its evaluation of the Pre Qualification Questionnaire (PQQ) responses and aims to award a contract by July 2013. David Waboso, LU’s Capital Programmes Director said: ‘We are using the new ICE procurement process for the first time with this project. The process has been designed to allow bidders to bring their expertise and knowledge to drive innovation that will reduce cost and risk to the project. This innovation will be commercially confidential to each bidder so they are able to fully derive the value and competitive advantage of their innovation through the procurement process. The evaluation criteria used in the PQQ, targeted the contractors’ ability to deliver and innovate. The four strong bidding groups will be able to use their significant global infrastructure experience at Bank Tube station, which will be one of London Underground’s biggest and most complex projects. Great to see ECI finally being used properly in the LU environment.